Are you interested in becoming a freelance voice artist, translator or subtitler working for Matinée Multilingual? How can I apply to be a Matinée voice talent? We only add experienced voice artists to our database. If the language we require is in demand, the first thing we’ll want to see from you is your professional showreel, examples of previous work and your CV. Please submit downloadable demos as .MP3 or .WAV format only. 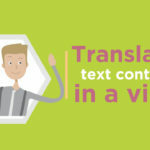 How can I apply to be a freelance subtitler/translator? If there is a vacancy for a certain language, we’ll add it to the ‘what’s in demand’ list below. Applicants must ideally have experience in translating for voice-overs and subtitles. Applicants will be provided with a subtitling test that they must pass before we can consider them. What's in demand right now? We’ll try to update this section as frequently as possible. I need to update my voice-over show reel. We offer two show reel packages, that will be edited by our audio engineers to an industry standard. This service is available during the studio opening hours on Monday – Friday only. Click here to see what each package includes. If your language and skill is in demand and you wish to apply, please fill the form below and we’ll get back to you within hours.